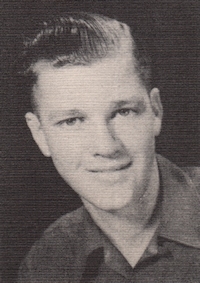 Obituary – Freese, Walter Harlin « Perry High School Alumni Association, Inc.
Walter Harlin Freese, 85, passed away on Monday, September 12, 2016. Arrangements are under the care of Palmer Marler Funeral Home of Perry. Funeral service will be held on Friday, September 16, 2016 at 2:00pm at the First United Methodist Church in Perry. Interment will follow the service at Grace Hill Cemetery. Visitation will be held Thursday, September 15, 2016 from 9:00am to 8:00pm at the funeral home, with family greeting guest from 6:00pm to 8:00pm. Walter was born June 24, 1931 in Perry, Oklahoma to Henry and Fern (Moore) Freese. Walter attended Lone Star grade school and began his freshman year at Hayward, Oklahoma. He graduated in 1949 from Perry High School. Walter was a member of Perry FFA. He attended Okmulgee Tech School for one year. In 1951 Walter was drafted and served on the front lines in Korea from 1952-1953. After he returned from Korea he started work in the oilfield. He later became employed in Highway construction; working on I35. During this time, Walter was also engaged in farming. On November 11, 1961, he married the former Genevieve Skluzacek. To this union, two children were born, Dayna Michelle and Darren Jay. Walter served on the school board for White School and on the Lucien Rural Water District #1 and for 38 years on the Noble County Soil Conservation District. He was a member of the First United Methodist Church of Perry. Walter was a man with many irons in the fire. He was a full time farmer/Rancher for 66 years while also doing dirt construction work running a bulldozer, scraper and grader. He built the pads for the local McDonalds, Braums and Perry Memorial Hospital heli-pad. Walter always had time to fit in his daily coffee breaks with his buddies, where they would contemplate all the worlds’ problems. When he wasn’t working, he loved to weld and fabricate anything possible. He enjoyed target shooting with his kids, and loved the art of Blacksmithing. He also raised Brangus cattle until his passing. Walter is survived by his wife of 54 years, Genevieve of the home; daughter Dayna Peterson and husband Rick of Jones, Oklahoma; son, Darren Freese and wife Charlotte of Sherman, Texas; sister Elaine McLean of Del City, Oklahoma, Nevalee Sewell and husband James of Guthrie, Oklahoma and Nevalyn Stotts of Stillwater, Oklahoma; one granddaughter Morgan Freese of Gunter Texas; and three step-grandsons, Rick Peterson Jr., Jason Peterson, and Cameron Clark; one step-grand daughter, Ashley Stark. Walter was preceded in death by his parents, Henry and Fern Freese and three brother-in-laws, Robert Hirschman, Bill McLean, and Gerald Stotts.